These last few weeks, well actually the last few months, have been difficult. I have attended the funerals of two people whose lives where cut off to soon. I have experienced many deaths in my life. Many of the deaths were back to back. Yet, I made it through. Death is not unavoidable. Death is inevitable. We are born and we must die. This is a fact. Yet, I do not believe we actually think about dying until someone close to us dies. This is when death becomes a reality. This is when we realize that each passing day is a blessing. We do not know when our time upon this earth will be up. Only God knows the day and hour we will breathe our last breath. Yet, when we read the Bible, God did not say our life would be easy. 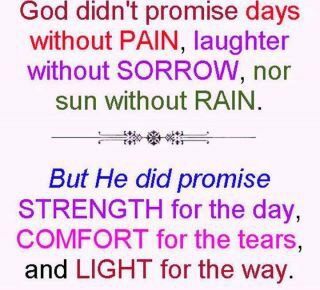 He did not say we would not suffer hardships, go through pains and troubles. In fact He said we would! One of my favorite scriptures is John 16:33, “I have told you all this so that you may have peace in me. Here on earth you will have many trials and sorrows. But take heart, because I have overcome the world.” Jesus told us we would have many trials and sorrows, yet we should not worry about them. When we are rooted and grounded in Christ and His Word, we can have God’s peace which goes beyond our understanding when we go through pains, trials and hardships. Jesus tells us he overcame the world and so will we! We simply have to go through to get to the other side. In other words, we will have to go through pains, hardships and suffering in this life before we spend eternity with our beautiful Lord and Savior! 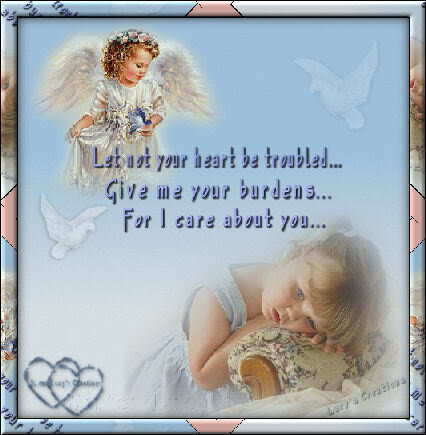 God promises us, “He will wipe every tear from their eyes, and there will be no more death or sorrow or crying or pain. All these things are gone forever.” (Rev. 21:4) In our Heavenly home we will not have to worry about death, sorrow, hardships, pains and sufferings! Those of you who are going through hard times. Those of you who have lost a loved one. I know how you feel. The only way I got through it all, was by the grace and mercy of our Lord and Savior Jesus Christ. I had to lean, depend on and trust in Him to see me through. I am here as a living witness to the powerful healing of Jesus Christ. He has healed my broken heart. He has brought me through many storms. I am so thankful I have learned to trust in Him! My friends, place you hope in Christ! Only He can heal your broken hearts. Only HE can heal your wounds. Only HE can turn your sorrow into joy. Only Christ can get you through this life and to the glorious other side in Heaven. Call upon Him today and ask Him to take you broken pieces and make you whole again. He will. He did it for me and I know He will do it for you!